LACK SNOWBIRD, in most of the United States and in Ontario, where it is a common resident, and White Bill, are names more often applied to this species of Sparrow than the one of Junco, by which it is known to ornithologists. It nests in the mountains of northern Pennsylvania, New York, and New England, and is a resident throughout the year in northeastern Ohio, and in Michigan. In all probability, the Snowbird does not breed, even occasionally, anywhere within the limits of the state of Illinois, though individuals may in very rare instances be found several weeks after others have departed for the north, these having probably received some injury which prevents their migration. Prof. Forbes refers to such an instance, which came under his own observation. He saw on a tree in the edge of a wood, in the southern part of the state, an adult specimen of the Junco, and only one, which, he says, astonished him. 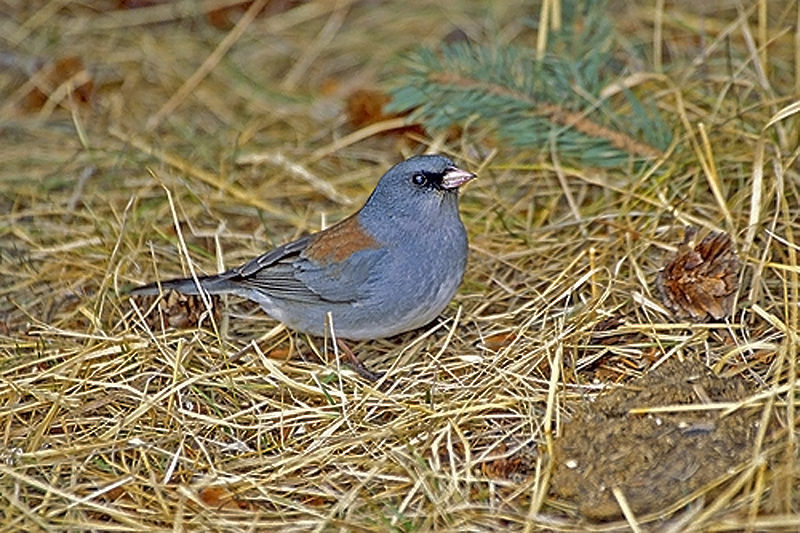 Mr. William L. Kells states that in Ontario this Junco selects a variety of places for nesting sites, such as the upturned roots of trees, crevices in banks, under the sides of logs and stumps, a cavity under broken sod, or in the shelter of grass or other vegetation. The nest is made of dry grasses, warmly and smoothly lined with hair. The bird generally begins to nest the first week of May, and nests with eggs are found as late as August. A nest of the Junco was found on the rafters of a barn in Connecticut. Almost any time after the first of October, little excursion parties of Juncos may be looked for, and the custom continues all winter long. When you become acquainted with him, as you surely will, during his visit, you will like him more and more for his cheerful habits. He will come to your back door, and present his little food petition, very merrily indeed. He is very friendly with the Chick-a-dee, and they are often seen together about in the barn-yards, and he even ventures within the barn when seeds are frozen to the ground. Range—North America; breeds from northern Minnesota to northern New York and southward along the summits of the Alleghenies to Virginia; winters southward to the Gulf States. Nest—Of grasses, moss, and rootlets, lined with fine grasses and long hairs, on or near the ground. Eggs—Four or five, white or bluish white, finely or evenly speckled or spotted, sometimes heavily blotched at the larger end with rufous-brown. What a neat story about helping the Juncos out of the cold. 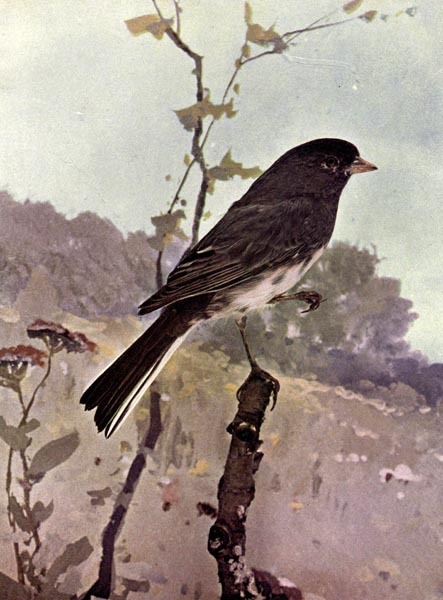 The Junco the writer is referring to a subspecies the Dark-eyed Junco. 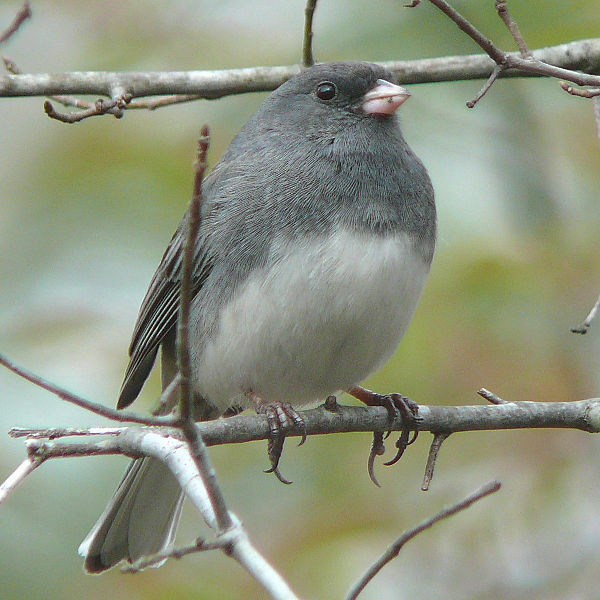 The Slate-colored Junco has 3 subspecies of the Dark-eyed, the hyemalis, carolinensis, and the cismontanus. The photo at top is more of the Dark-eyed dominate species. 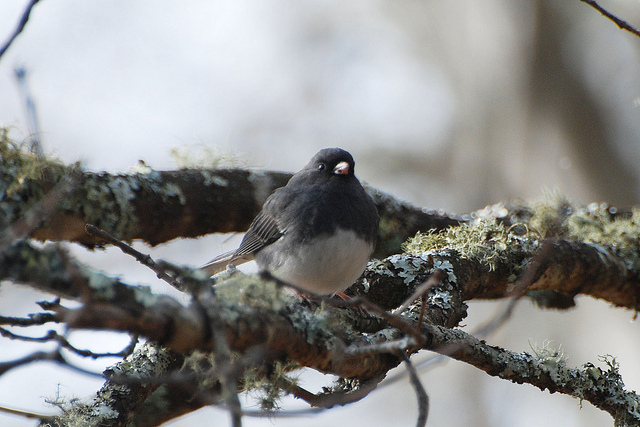 There are over 15 subspecies of Dark-eyed Juncos. Adults generally have gray heads, necks, and breasts, gray or brown backs and wings, and a white belly, but show a confusing amount of variation in plumage details. The white outer tail feathers flash distinctively in flight and while hopping on the ground. The bill is usually pale pinkish. Males tend to have darker, more conspicuous markings than the females. 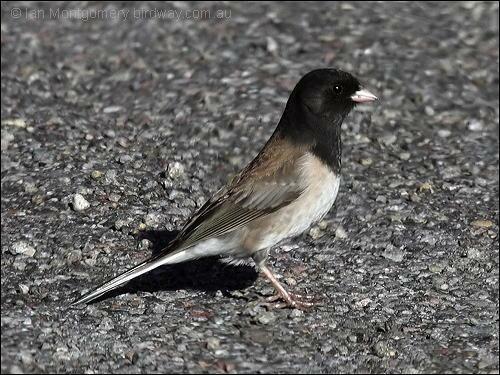 The Dark-eyed Junco is 5.1 to 6.9 in (13 to 17.5 cm) long and has a wingspan of 7.1 to 9.8 in (18 to 25 cm). Juveniles often have pale streaks and may even be mistaken for Vesper Sparrows (Pooecetes gramineus) until they acquire adult plumage at 2 to 3 months. But junco fledglings’ heads are generally quite uniform in color already, and initially their bills still have conspicuous yellowish edges to the gape, remains of the fleshy wattles that guide the parents when they feed the nestlings. The song is a trill similar to the Chipping Sparrow’s (Spizella passerina), except that the Red-backed Junco’s song is more complex, similar to that of the Yellow-eyed Junco (Junco phaeonotus). The call also resembles that of the Black-throated blue warblers, which is a member of the New World Warbler family. Calls include tick sounds and very high-pitched tinkling chips. All sounds provided by xeno-canto.org. The above article is an article in the monthly serial for October 1897 “designed to promote Knowledge of Bird-Live.” These include Color Photography, as they call them, today they are drawings. There are at least three Volumes that have been digitized by Project Gutenberg. This entry was posted in Birds, Kid's Section and tagged Birds Illustrated by Color Photography, Birdwatching, Christian, Dark-eyed Junco, Emberizidae, Home School, Kids, Photography, Slate-colored Junco, Snowbird, Vol 2 #4 Oct 1897, Youth. Bookmark the permalink.